Amazon is applying a nice 30% discount on 41008 Heartlake City Pool . Asking price is only $27.99, down from $39.99 MSRP. Free Super Saver Shipping starts at $35 or free 2-day with no minimum if you’re a Prime member. 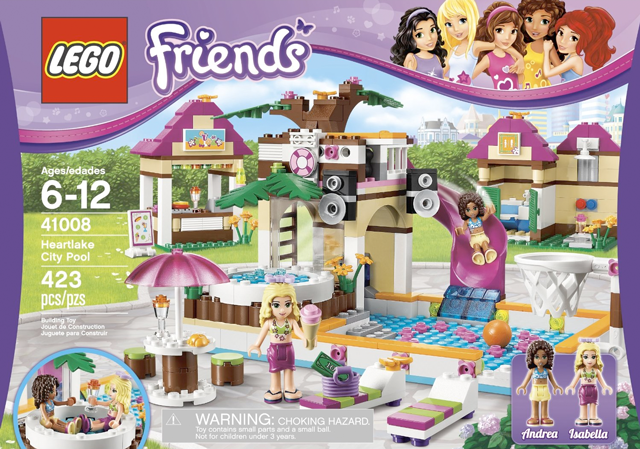 41008 Heartlake City Pool comes 423 pieces and includes Andrea and Isabella minidolls. Amazon Has 41008 Heartlake City Pool In Stock! Amazon.com is selling 41008 Heartlake City Pool for $39.99. It’s the same price as LEGO Shop@Home, but you get Free Super Saver Shipping in time for Christmas if you order in the next three days. Also there’s no sales tax to most states. Shop@Home offers VIP Points and free shipping if you order $49 or more, but charges sales tax. In addition to the City Pool set, they also have 41007 Heartlake Pet Salon in stock for $29.76. They also have all of the $9.99 sets such as 41011 Stephanie’s Soccer Practice but the price is $2 more than what Shop@Home charges. LEGO Shop@Home Has More 2013 Friends Sets In Stock! I can’t wait to get my hands on some of those animal packs! There are two new sets from the 2013 assortment for sale on LEGO Shop@Home. This set costs $29.99 and comes with 242 pieces. It includes new designs for Emma and a new Friend minidoll character, Joanna. The City Pool set costs $39.99 and like the Pet Salon set, it introduces a new character: Isabella! It also comes with a new version of Andrea. You get 423 pieces that make up a pool, hot tub, food stand, and table and chairs.